Juventus desperately needed a win against Real Madrid this Tuesday night, but Cristiano Ronaldo and Gareth Bale had a slightly different plan in mind. The CR7 & GB11 partnership delivered the two goals for the visitors and rescued a point that has almost sealed the deal for Madrid in terms of qualifying for the last-16 stage of the UEFA Champions League. 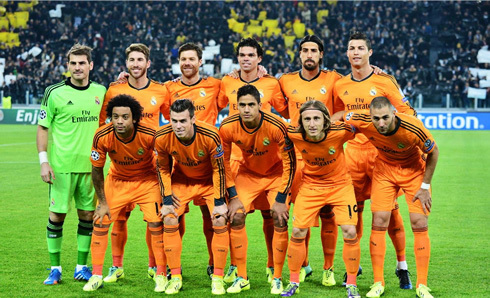 Ancelotti went into this game against Juventus with Sergio Ramos as right-back and Pepe partnering up with Varane in the center. The left-back spot was taken by Marcelo, as Fábio Coentrão is still recovering from a twisted ankle injury that he picked up last Saturday against Rayo Vallecano. Xabi Alonso got his second consecutive start in midfield, backed up by Sami Khedira and Luka Modric. 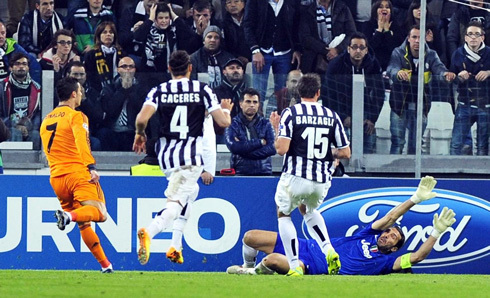 Upfront, it was up to Gareth Bale, Cristiano Ronaldo and Karim Benzema to spark the panic in Juventus' defense. However, that opening goal in the 42nd minute of the first half seems to have awakened Real Madrid and we finally got to see Carlo Ancelotti's men playing some positive football. The ball started flowing more smoothly and the team moved their lines forward on the pitch, in a clear attempt to intensify the pressure. The equalizer arrived roughly 7 minutes after the break, in a counter-attack that started with a bad pass made by Cáceres that got deflected by Cristiano Ronaldo. 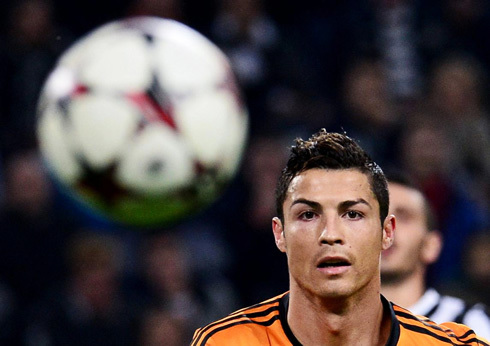 The ball felt over to Karim Benzema, who moved up a few meters just before passing it back to Ronaldo on his left. The Portuguese star didn't get intimidated with the hostile crowd he had against him in Turin and struck the ball past Gianluigi Buffon to put things square in Italy soil. Juventus had clearly lost the initiative and the aggressiveness levels they had shown throughout most of the first half and it was now up to Real Madrid to dictate their laws. The 1-2 was produced by an inspired moment of Gareth Bale, but it was Cristiano Ronaldo who got to set it up for the former Tottenham star. The Portuguese forward escaped Cáceres marking to receive a long pass from Marcelo, cutted inside and left the ball over to Bale on the right. The Welshman showed no fear whatsoever and even without much space to prepare his shot, he finished it off with a strong and accurate strike. 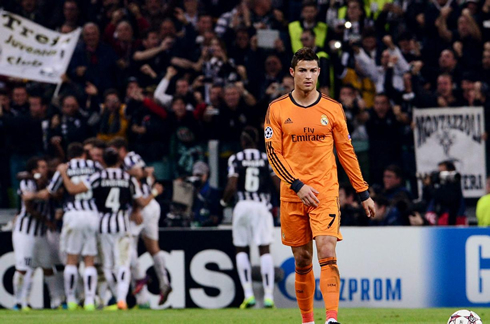 Great attacking football from Madrid as the visitors had finally taken Turin by storm! Cristiano Ronaldo next game for Real Madrid will be against Real Sociedad for the Spanish League 'La Liga', this Saturday (November 9, 2013). 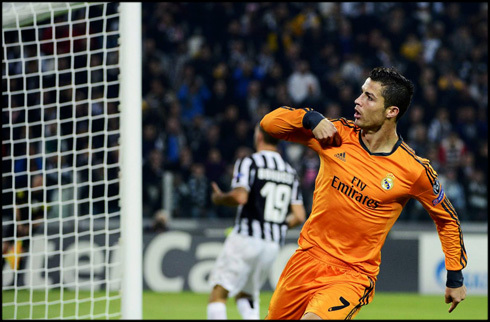 You can watch Juventus live stream, Real Madrid vs Real Sociedad, Barcelona vs Milan, Chelsea vs Schalke 04 and Borussia Dortmund vs Arsenal, all matches provided from our soccer live games section.